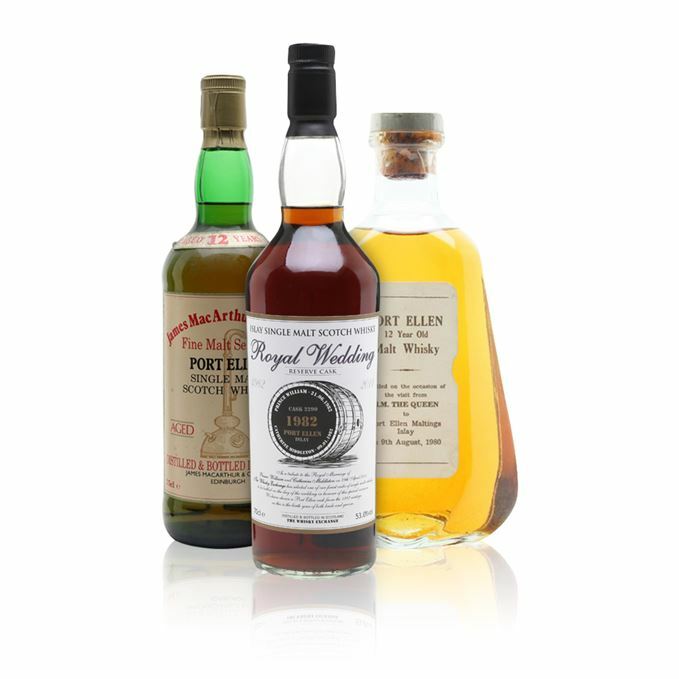 A recent opportunity to acquire samples of some of the world’s rarest bottlings of Port Ellen has tempted Angus MacRaild to dedicate this latest old and rare tasting to this most lauded, cult and debated of distilleries. While some remain divided over the merits and qualities of the distillery’s output, MacRaild argues that there are many bottlings that sit comfortably in the pantheon of greatness and affirm it as a legendary distillate. While it may be possible to pick and chose some clunkers from among the hundreds of single casks released over the years, and there are those that find the distillery character a tad too brutal at times, MacRaild believes that when Port Ellen really shines, it can be truly dazzling. For this session MacRaild has lined up three Port Ellens with pretty serious reputations. 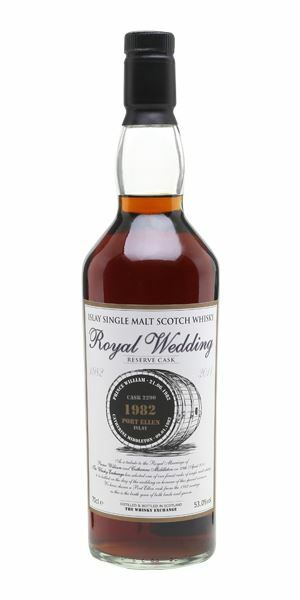 First up is a 1982 vintage bottled in 2011 by The Whisky Exchange to commemorate the Royal Wedding of William and Kate. A scarce and potent example matured full term in a pretty active Sherry cask. 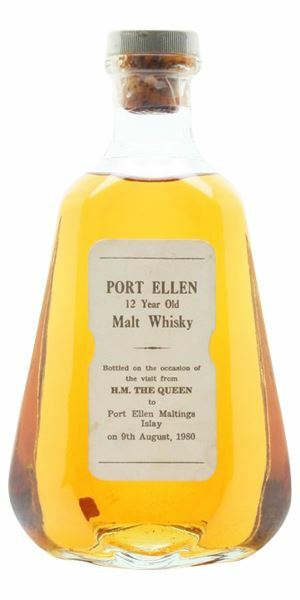 Following is perhaps one of the most famous and elusive Port Ellens – the 12-year-old official bottling for the Queen’s visit to the distillery in 1980. 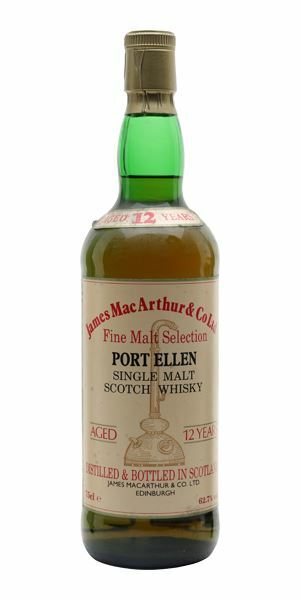 Until the Malting’s Anniversary 21-year-old in 1998, this was the only official bottling of Port Ellen. Indeed it is one of just two known examples released while the distillery was still in operation, the other being an even more elusive 12-year-old 1970 bottling by Samaroli that is reputed to contain Port Ellen. It is also worth noting that the whisky inside this one was drawn by Iain ‘Pinkie’ McArthur from two 1967 Bourbon hogsheads, making this the only known example of 1967 Port Ellen. This bottling has garnered something of mystical reputation since one was opened on Islay back in 2015 and gained a score of 99/100 on Whiskyfun, Serge Valentin’s highest scoring whisky ever. To crown it all off is the 12-year-old ‘pale’ version by James MacArthur. One of the very earliest independent bottlings of Port Ellen released in the 1980s, this would have been distilled around the early-to-mid 1970s and is often considered a companion piece to the even scarcer dark Sherry versions. The pale one itself, however, is still widely considered something of a masterpiece and MacRaild finds it hard to disagree with that assessment. An almost coppery, zingy peat at first, unfolding swiftly into leather saddles, preserved cherries, dunnage must, crushed black pepper, dried mint leaf and a background fizz of posh root beer. A beautiful and rather wonderfully integrated fusion and ballet of peat and Sherry – a scarce characteristic in today’s Sherried Islays. Develops further with coal smoke, black olives in brine and some anchovy paste (you could probably add this to a Puttanesca if you were feeling flush with cash and insanity). Water brings more coal dust, biltong and some nervous dried fruits and assorted citrus peels. The leatheriness continues but there are also some old cigar humidors, a velvety ashiness, various cured meats and prickle of hot paprika. Simmering peat oils, a few cola cubes and a scattered fistful of trail mix. Dried herbs emerge with time alone, with an ethereal peaty smoulder. Gets a tad sweeter, oilier and not a little kippery with time. Water seems to concentrate this peaty/oily/tarry quality further. There’s also a slightly earthy dirtiness which speaks to the true heart of Port Ellen’s character. Some crushed walnuts and salty rubber boots come traipsing through as well. Lengthy, fatty and pulsing with glistening peat oils and tarry rope. It’s all getting a little obscene isn’t it? One of the best of the latter day Port Ellens before new bottlings really began to dry up. Also, in my view, one of the best of the handful of dark Sherry examples that emerged from these early ‘80s vintages. Powerful, concentrated and undeniably thrilling – about as unlike the actual Royal Wedding as it’s possible to be. You and your friends, already flush with drink and food as the bells ring out at Hogmanay, step outside to some frosty New Year air to toast, celebrate and commiserate in style (someone should really have told Wills and Kate!). A real seesaw between briny and tropical aspects. In fact, at first it is almost reminiscent of some early-1970s Bowmores with this nervous ballet of tropical, citrus, mineral and salty qualities. Indeed almost all the 1969 and 1970 Port Ellens display tropical fruit qualities to some degree or another. Continues with some gravelly minerality, passion fruit, seashore bluster, hessian, preserved lemon and even a very slight waxiness. The nose keeps evolving with sea greens, limoncello, green olives and eventually becoming rather medicinal as well with notes of gauze and ointment. Swings back to fruits again with dried mango. Indisputably beautiful. There’s punch; it’s probably bottled around 46% abv. Salted tropical fruits, a flinty smokiness and notes of coconut, graphite oil and green tea – reminiscent of some older pre-reconstruction Caol Ilas. Dried kelp, peat oils, seawater, lime peel, citrons, mango, guava and papaya. A little green banana skin note as well. With time it assumes a salt-coated leather note. It becomes textural, mouth-coating and brilliantly silky. However, it’s never so dense or weighty that it looses this impression of deftness, there is an increasing sense of mind-boggling complexity about the whole thing. It’s one of these whiskies that is constantly evolving and changing form around a core central character. It’s a little more in control than I am it seems. Superbly long and filled with oils, camphor, myriad coastal complexities and many drying tropical fruit notes. I don’t quite agree with the ‘99’ assessment of my Whiskyfun compadre, but I do think this is stellar, and deservedly legendary whisky. The complexity, deftness of the fruit, evolution and overall character, length and balance are all utterly outstanding. A midnight seashore kiss with someone you’ve fancied for years. This one is immediately more gravely, grassier and more farmy. A little smoked wax, some boot polish, even some lightly vegetal aspects underneath these muscular notes of diesel oil, tar and Vicks rub. It’s rather monstrous, but beautifully so. This one makes some rather serious demands upon you. It makes you wait... with time there are coal hearths, many dried herbs, a drop of green Chartreuse, camphor and paraffin wax. There’s also an intensely stony side: concrete, chalk, ink, flints and pebbles. You just know water is called for here... with water it doesn’t so much as swim, as leap like a salmon. Is it possible to peat petrol? Notes of truffle salt, a little green malt, aloe vera and increasingly medicinal qualities that manifest as TCP, various potent ointments and a whole hospital of gauze and bandages. Raw, gristy, muscular, kippery and tempestuously coastal – a shot of peat to the head! Petrol, smoked cereals, aged dry Riesling, butter, dried seaweed, chopped chives, smoked tea, bergamot and the purest and most dazzlingly sharp peat. The whisky is very much master here; you don’t really have a choice but to follow it down the peat bog rabbit hole. Water brings further volume to the medicine but also widens the peat qualities so that they become earthier and more brooding. Ruthless and astonishing whisky! These sorts of brutal and overtly potent whiskies can walk a real tightrope, with many falling down on the side of imbalance and lopsidedness. However, this one retains a totally remarkable poise all the way throughout. A masterclass in raw power matched with precision and complexity to a degree that just knocks you for six. A whisky that almost controls you. It was touch and go between this and the Maltings but I feel this one just pips it. Well deserving of its reputation in my opinion.